The geological origins of the Mar Menor lie in the Tertiary Era, between 65 million and 1.7 million years ago, when the Baetic mountains were being formed and the area which is now the inland sea was an open bay on the Mediterranean coast. As a result of the folding and rising of the land over a period of around 10 million years, the basin of the bay was filled with a large quantity of sediment from the countryside of the Campo de Cartagena and the rivers and floodwater channels which ran through it. At the same time, a series of volcanic eruptions under the sea bed gave rise to the islands close to La Manga, the land masses of Calnegre and El Carmolí, and other small promontories. 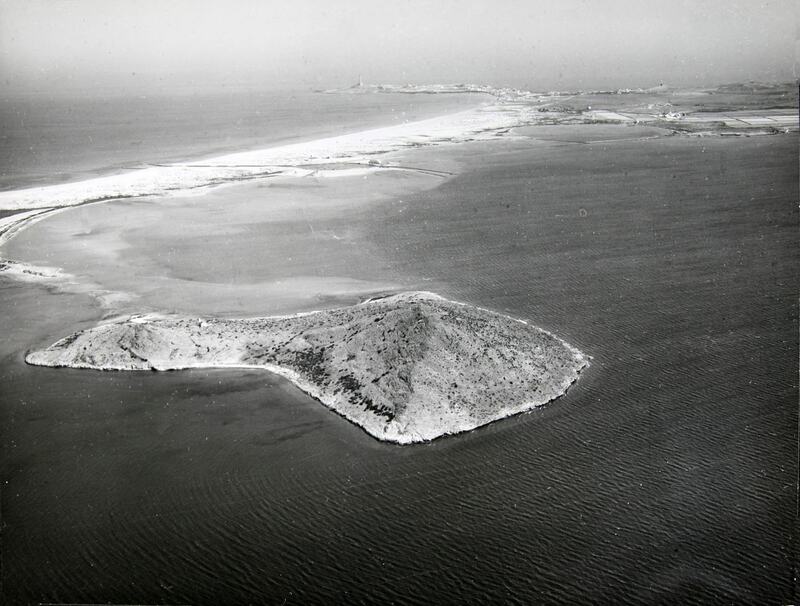 These areas of higher ground contributed to the natural tendency of the marine currents from the north to run into Cabo de Palos, depositing a spit of sand which gradually grew until it almost completely closed off the lagoon. This spit of sand, of course, is La Manga del Mar Menor. By about 2,000 years ago the Mar Menor had begun to look similar to what we know today: it was becoming a closed lagoon, linked to the Mediterranean only by small channels known as “golas”, and gradually became almost completely separate from the “Mare Nostrum” or Mediterranean, of which it had previously been a bay. Although prehistoric remains have not been found in San Javier itself, important discoveries have been made in and around the Mar Menor and the nearby Cabezo Gordo site in Torre Pacheco, and these provide valuable evidence concerning the inhabitants of the area in prehistoric times. The oldest traces of our ancestors have been found in the Cueva Victoria in nearby El Beal, within the municipality of Cartagena and close to the shores of the Mar Menor, and they belong to the pre-hominid known as Theropitecus Oswaldis, who lived in the area 2.5 million years ago. 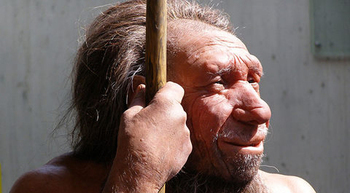 In the Cabo de Palos area remains have been found from, the eneolithic (the period when stone tools were being replaced by metal), which in the Iberian Peninsula dates to around 3000 BC. The Cabezo Gordo of Torre Pacheco is a sedentary rock formation dating back to the Triassic period, approximately 245 million years ago, and is only 6 kilometres from the centre of modern-day San Javier. In the past, though, the mountain was something of an island, rising up to an altitude of 312 metres above the surrounding flatlands and wetlands and giving a panoramic view of the Mar Menor, the marshy lands which would have surrounded it and the rich hunting grounds slightly further inland. Fossilized animal remains dating back several million years have been found at the Sima de las Palomas site on Cabezo Gordo, including those of elephants, rhinoceros, horses, deer and panthers, but the most important remains are those of Neanderthal man, dating back up to 150,000 years. The Sima de las Palomas is one of the most important Neanderthal sites in the whole of the Mediterranean due to the number of remains discovered here, and every summer the site is further explored by teams from the University of Murcia. Cabezo Gordo was also inhabited by the Phoenicians, who built a watchtower on the summit between 600 and 700 BC, helping them to consolidate their trading routes along the Mediterranean coastline. The Phoenicians were a trading nation, active throughout the Mediterranean from 1500 to 300 BC, and their activity in the vicinity of San Javier was particularly notable in the 7th century before Christ. Along with the Greeks, they established a trading port in what is now San Pedro del Pinatar, and both cultures took advantage principally of the shelter offered by the sandy spit of La Manga and the islands of Isla Grosa and Farrallón, as well as the protection of entering the Mar Menor itself. From here they traded with the native population, and in San Javier they left behind them one of the most important Phoenician archaeological sites in the Mediterranean, the Bajo de la Campaña shipwreck. This vessel was laden with trading goods when it ran aground on a rock and sank, slipping its contents onto the sea bed below. These included ivory from Africa, raw minerals, copper and tin in rough smelted ingots, wooden combs, ceramics which may have contained oils or fish sauces, and vast quantities of raw, unsmelted minerals. It is a rare and important site for those studying this enterprising culture, and it tells us much about the Phoenicians, who they were, and what happened to them. The Carthaginians arrived in south-eastern Spain in 227 BC, taking control of lands occupied by the Iberians to found the city of Cartagena after settling in areas which offered safety and the potential to trade and create wealth. The rich mines of the Sierra Minera between Cartagena and La Unión yielded silver, creating the chance to mint coinage and pay for armies. But the Second Punic Wars left Cartagena defenceless, as the Carthaginian general Hannibal took his troops and set off to attack first Sagunto and then Rome on his famous (and ultimately pointless) journey across the Alps with his fighting elephants. 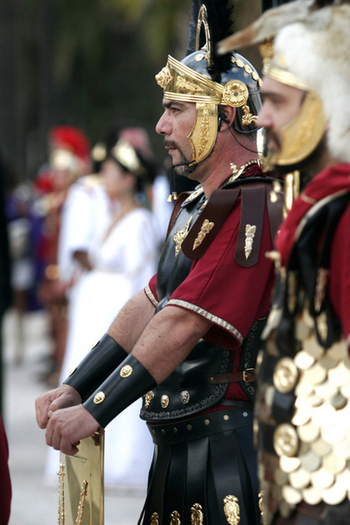 The Romans exploited his absence and took Cartagena in 209BC, swiftly undertaking the exploitation of the natural resources of the area, and subsequently the flats around the Mar Menor were farmed to produce salt which was used in the creation of salted fish delicacies. The Mar Menor was ideal for this activity, and salted fish (nowadays “salazones”) was an important industry in the area, producing intensely flavoured fish sauces which were essential in Roman cuisine, the most famous of these being garum. There was certainly important marine traffic in the area at this point, evidence of which can be found in the numerous archaeological remains discovered beneath the waters: in fact, a Roman wreck was found on top of the Phoenician Bajo de la Campana wreck, having foundered on the same rock around 700 years later! The Mar Menor was linked by land to the Via Augusta, a major arterial trade route which began in Cádiz and followed the Mediterranean coast (with occasional detours inland) all the way to France and then linking into other roads, to Rome. Agricultural villas, or farmsteads, were built to farm the land, yielding olive oil, dry crops and wheat, as well as valuable food for the 35,000 slaves extracting silver and lead from the Sierra Minera, and one example of these is the Roman Villa of La Raya in San Pedro del Pinatar. The Moors took control of the Murcia area in 713 AD by the terms of the “Pact of Tudmir”, and some of the settlers from North Africa set about farming the land and developing fishing techniques. One of the more ingenious of the latter were the devices known as “encañizadas”: these were placed in the natural channels (golas) between the Mar Menor and the Mediterranean to trap fish in a labyrinth of cages from which they were unable to escape. This style of encañadiza fishing is still used today in San Javier to catch mullet and other species typical of the Mar Menor. Although the Mar Menor was known as the Albufera at this time (a Moorish term which is still used to refer to the wetlands south of the city of Valencia), there are relatively few place names which derive from Arabic. This is because many of the new inhabitants preferred to establish themselves further inland and in the Segura valley: indeed, it was the Moors who founded the city of Murcia. The countryside around Santiago de la Ribera was dotted with watchtowers, and there were also a few buildings whose purpose was to provide leisure and rest. This was certainly the case in the neighbouring municipality of Los Alcázares, where the Moors built palaces in order to take advantage of the baths left by the Romans, but there is very little concrete evidence of habitation in San Javier during the period of Moorish rule in southern Spain. The Moors remained in power across Southern Spain until the forces of the powerful Catholic Kingdoms of Aragón and Castilla pushed southwards in search of more territory, and this eventually led to the defeat and expulsion of the African rulers. 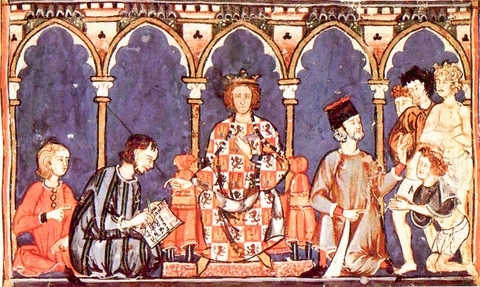 In 1243 Murcia was absorbed into the protectorate of Castilla by the "Capitulations of Alcáraz", and the Castilian monarchy established firm control of the area during the reign of Alfonso X “El Sabio” (1252-84). However, Murcia now became a dangerous area as it was so close to the last remaining Moorish kingdom of Granada, and the conflict continued throughout the reign of Alfonso X and beyond. There were frequent uprisings among the “Mudéjars” (those Moors who had been allowed to stay in Murcia), and the threat of incursions by raiders from Granada remained for another 250 years: in the Mar Menor area, of course, there was the extra threat of invasions by sea, and in this context it is not surprising that the area remained largely unpopulated. However, some steps were taken to provide security. The shoreline of the Mar Menor was now in Christian hands, and in 1266, coinciding with a Mudéjar revolt, Alfonso X ordered that the residents of Murcia should help farmers along the coast when Moorish boats were sighted within reach of the coast. To facilitate this he ordered the construction of watchtowers where local residents could light beacons and send smoke signals, in a chain of buildings which culminated in the tower of the Church of Santa Catalina in Murcia, warning the population of imminent danger. Alfonso X also began an attempt to repopulate the area with Christian families migrating from the north, many of them from Navarra: land was given to the noble families who provided armed support, and incentives were offered to bring new settlers to the area. Familiar names date back to this period, with the families of Pacheco, Roldán, Roda and Pagán among those who are now remembered in the names of towns and villages: others who have not been commemorated in this way include the families of Saavedra and Galtero. Although the repopulation of coastal areas of Murcia continued throughout the late Middle Ages, by the 16th and 17th centuries the attacks by Berber pirates coming from North Africa caused another drop in population as residents fled from the constant danger. Marauding ships from African coastal ports would sail across to the Spanish coastline, landing and moving inland to sack villages and towns, steal livestock, crops and anything of value. They also took hostages, who would be ransomed back if they were of any value, or sold in slave markets if not. Entire communities were burnt and destroyed in their attacks, and there are records of raids as far inland as Calasparra in the north-west of Murcia. The most infamous of these pirates was Morato Arraez, who was active at the beginning of the 17th century, and who played an important part in the events which became known as the Miracle of Mazarrón, celebrated each year in the Romeria of the Virgen del Milagro. 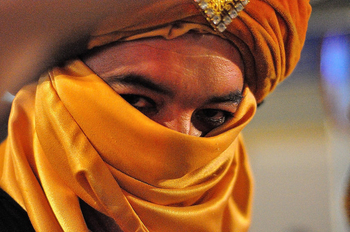 His exploits are also commemorated in the Berber Fiestas in Los Alcázares, when many of the local population don pirate and peasant costumes to enjoy several days of parades and partying. Life in coastal regions of Murcia was hard and hazardous, then, but there was nonetheless a population to defend, and Felipe II (1556-98), the monarch whose ambitions of seafaring supremacy led him to organize the Armada which sailed for the British Isles in 1558, made sure that steps were taken to reinforce the southern coast. In what is now Murcia and Alicante he ordered that a series of watchtowers be built along the coast, and some still remain, for example in La Torre de la Horadada, Puerto de Mazarrón, La Azohía and Águilas (the Torre de Cope). In this environment the first seeds were sown of what is now the town of San Javier, as the population began to enjoy greater security and settle permanently in propitious areas, mostly around sources of drinking water. Much of the land close to the shore of the Mar Menor, especially in La Calavera and La Grajuela, was owned by ecclesiastical institutions based in the city of Murcia, and the Murcia council controlled the water sources, but groups of farmers, fishermen and other inhabitants slowly coalesced into significant populations. By the end of the 17th century these villages had established themselves sufficiently to build their own small churches, and in the vicinity of what is now San Javier were those dedicated to San Cayetano, San Pedro del Pinatar, Nuestra Señora de los Dolores and San Francisco Javier as well as another at La Encañizada. 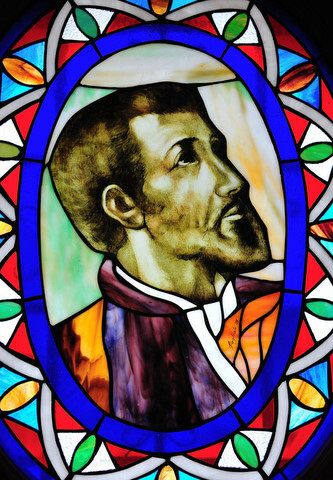 San Francisco Javier was a Jesuit priest from the northern Spanish region of Navarra, who lived between 1506 and 1552 and was best known for his missionary works in the Far East. For 10 years he preached throughout India and Japan, converting thousands to the Christian faith, before his death on the island of Sanchon Sancian, at the gates of China. He was known as the "gigante de la historia de las misiones" (the giant of missionary history), and was named by Pope Pius X as the official patron of overseas missionaries. 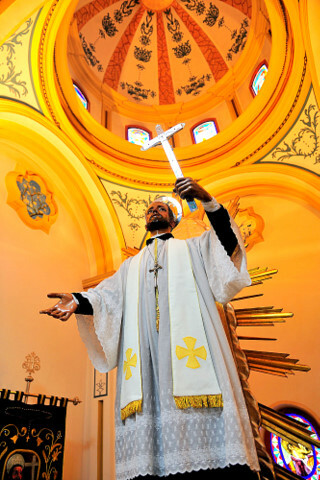 His life story makes for extraordinary reading, as he battled with illness and adversity while working his way through India, China, Japan and Africa preaching and converting. 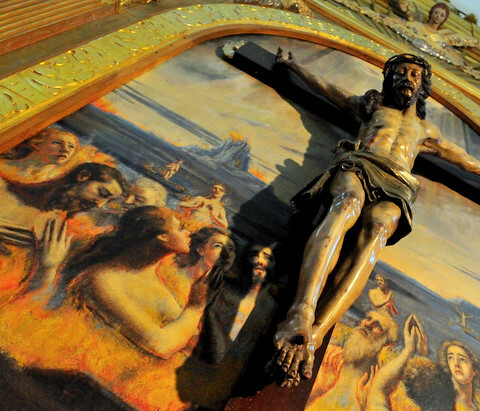 He was beatified by Pope Paul V in 1619, and canonized by Gregory V three years later, and the cult of devotion to the Saint was brought to this part of Murcia by the families from Navarra who re-settled close to the Mar Menor during the repopulation programs of the 16th century. The saint was popular as a protector against the fevers and illnesses which prevailed at the time, caused by the prevalence of mosquitoes in the marshland areas close to the Mar Menor: these were considerably wetter 500 years ago than they are today, and it is known that there were still pine groves and wild deer until at least as late as the 16th century. The first small church dedicated to his honour was built in roughly the same position as the current church, at the crossroads which linked the main coast road (the Roman Vía Augusta, as mentioned above) with the road which provided communication with the city of Murcia. A cluster of rudimentary dwellings formed around the church, and gradually spread to incorporate the hamlet of La Calavera as well as attracting populations from the Cabezo Gordo. In 1698 Francisco Fernández Angulo, the Bishop of Cartagena, consecrated the place of worship as a parish church, and the following year work began to build the new church of San Javier. This project was completed almost a century later in 1787, and the result was the building which can be seen today. At this time, in the late 18th century, the city council of Murcia appointed local Mayors in the rural outposts of Torre Pacheco and San Javier, grouping the villages of Calavera, Tarquinales, Grajuela, San Pedro del Pinatar, Roda, San Cayetano and Dolores under their control. Each of the two centres had a “Casa Tercia”, which was used to collect the “diezmo” tax, equivalent to 10 per cent of income generated in the area. By this point the Berber attacks had long since ceased, and the population began to grow significantly. In 1809 there were 408 residents in San Javier, Roda and La Calavera, and by the time of the three-year Liberal government in Spain (1820-23) San Javier, along with Sucina, Corvera and Torre Pacheco, was considered large enough to warrant its own Town Hall. Unfortunately for the locals, though, the French intervened and reinstated the absolutist monarchy, and those localities with newly acquired Town Hall status were stripped of their privilege as a result: in the case of San Javier, this meant a return to being governed from Murcia. Nonetheless, the growth of the town continued, and soon afterwards, on 9th March 1836, the independent municipality of San Javier was formed (in the same year as San Pedro del Pinatar). It included the villages of La Calavera, Grajuela, Roda and Tarquinales, as well as pasture land in Los Alcázares and La Manga. But the latter years of the 19th century were not kind to San Javier, and economic hardship led many to leave and seek work in the mines of La Unión, or indeed much further afield in Oran, on the coast of Algeria. Those who were left numbered just 3,770 by the turn of the century, and they made their living as best they could as farmers, agricultural labourers, fishermen and artisans. Some in San Javier could have feared that their town was soon to return to the poverty of the Middle Ages, but at the same time some families made considerable sums of money by selling land, and a new middle class emerged, consisting of property managers, mining entrepreneurs, agricultural administrators and other professionals. In 1888 a preacher named José María Barnuevo founded a new village on the shore of the Mar Menor, and named it after the religious and military order to which he belonged, the Orden Militar de Santiago. This village, of course, was Santiago de la Ribera, and along with the first houses the church dedicated to Santiago Apóstol was also built in time for the town’s founding father to be buried there. 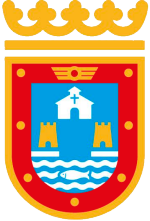 The importance and prestige of San Javier rose significantly in 1932, when the “Escuela de Aeronáutica Naval” (Navy aeronautics school) was established in Santiago de la Ribera. This brought bomber and fighter planes to the shore of the Mar Menor, as well as seaplanes taking advantage of the calm water of the inland lagoon, and alongside it was the “Naval Aero-station”, operating balloons and airships, although this lasted only until 1933. The end of the Spanish Civil War (1936-39) and the unification of the various military aviation services in the Air Force ushered in the golden age of the airbase at La Ribera, and in 1943 the Academia General del Aire (General Air Academy) was founded. This brought about a significant increase in the population, due to the influx of staff based at the academy and their families, and the Ciudad del Aire was created in order to satisfy the demand for housing. Since then the luminaries to have studied at San Javier include Kings Juan Carlos I and Felipe VI, and the base has also been home for many years to the “Patrulla Águila” aerobatic display team (Spain’s equivalent to the UK’s Red Arrows). The importance of the military airbase in San Javier was extended to a different sphere in 1967, when civil aviation flights were first authorized there, and the following year the passenger airport of San Javier opened for the first time. By 2007 the airport terminal was dealing with 2 million passengers per year, although numbers have fallen since. 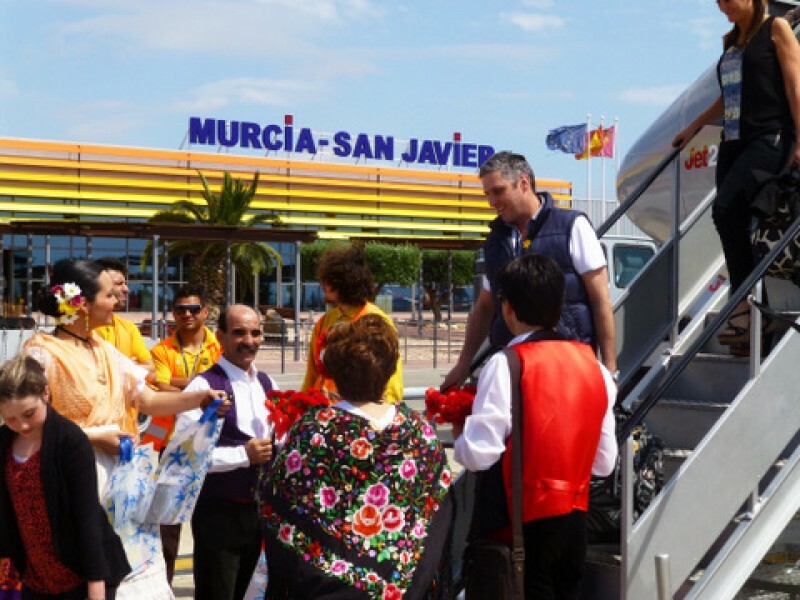 Since the 19th century there had been a tradition for people of Murcia and those working in the farmland of the Campo de Cartagena to take their annual holidays along the coastline of the Mar Menor. In the days when all the agricultural work was done by hand and animal labour, a migrant population of people known as the huertanos, the orchard dwellers, would go where the work went, building themselves temporary houses (“barracas”) from wild canes and mud, and during the summer they would come to the shore of the Mar Menor to cool down during the hottest months of the year. 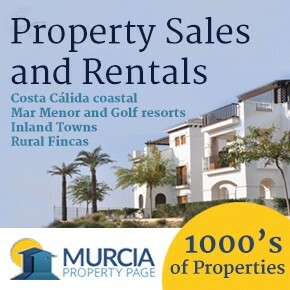 However, it was not until the 1960s that the phenomenon of modern tourism really arrived in San Javier, and as the Region of Murcia suddenly became popular during the summer with residents of Madrid there was a massive construction boom in La Manga. 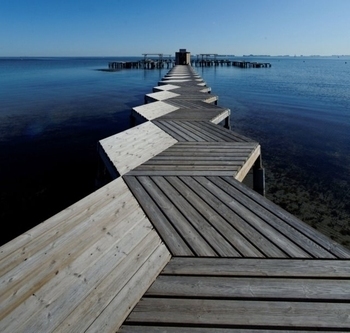 What had originally been sparsely used pasture land was now transformed into a modern beach paradise, and the whole economy of San Javier (and other Mar Menor towns) was transformed as a result. It was this which led to the military airport being designated appropriate for civil aviation, a situation which remains the case at the time of writing and which has provided significant employment in the municipality for the last few decades. At the same time, of course, the opening of the airport and the construction of the motorway to Alicante opened up this part of the Costa Cálida to international tourism, and nowadays the municipality includes 8,000 non-Spaniards among its 31,000 inhabitants. Certainly the majority of these are South Americans and north Africans working in agriculture, but there are well over 2,000 from EU countries and the UK, and San Javier has become cosmopolitan to a degree which would have been hard to imagine only 25 years ago. 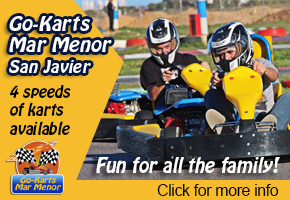 This popularity with foreign visitors is doubtless due for the most part to the 23 kilometres of coastline within the municipality, most of it in La Manga, but at the same time initiatives have been launched to ensure that San Javier is prestigious for other reasons. The annual San Javier Jazz Festival is one of the most prestigious musical events in the calendar of the Region of Murcia, and is just one item on a busy cultural agenda throughout the year: the town is also well-known, for example, for its huge Christmas nativity scene in the main square alongside the parish church. At the same time, agriculture and fishing continue to play an important role in the local economy, with farmland providing a variety of crops in the districts of El Mirador, La Grajuela, Roda, Los Sáez, Pozo Aledo and La Calavera, but the decision to dedicate the parish church to San Francisco Javier centuries ago is now revealed to have been an exceptionally wise one: in recognition of his travels around the world, the Jesuit missionary is honoured to be the Patron Saint of Tourism!